If you run a multi-author blog, then notifying the authors when their blog post is published can help them promote the post and participate in the discussion. Recently, one of our readers asked if it was possible to email authors when their articles are published. 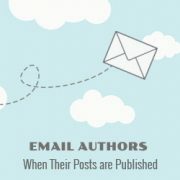 In this article, we will show you how to email authors when their posts are published in WordPress. First thing you need to do is install and activate the Edit Flow plugin. For more details, see our step by step guide on how to install a WordPress plugin. Edit Flow works out of the box for email notifications. As soon as you activate the plugin, it will start sending email notifications to authors when their posts are published. However, it does not send those email notifications to site administrator. 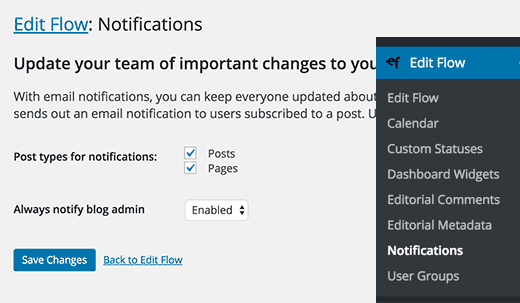 You can go to Edit Flow » Notifications page and select enable for ‘Always notify blog admin’ option. Edit Flow is a powerful plugin, and it can do a lot more than just sending email notifications. For a full overview of what you can do with it, see our guide on how to improve your editorial workflow in WordPress with Edit Flow. This method is for users who just want to send email notifications to authors without any other editorial features of Edit Flow. First thing you need to do is install and activate the Better Notifications for WordPress plugin. Upon activation, you need to visit Notifcations » Add New page to create your author email notification. First you need to a enter a title for this notification, for e.g. ‘Post Published Notification for Authors’. In the ‘Notification for’ field, you need to select ‘New post published’. Under Additional Email Fields option, check the box next to ‘Send this notification to the Author only’. Now you need to write a subject line and email body. Better WordPress Notifications comes with a handful of shortcodes that you can use in your email subject and body. We just published your post “[post_title]”. Finally, you need to click on the save button to store your new notification. 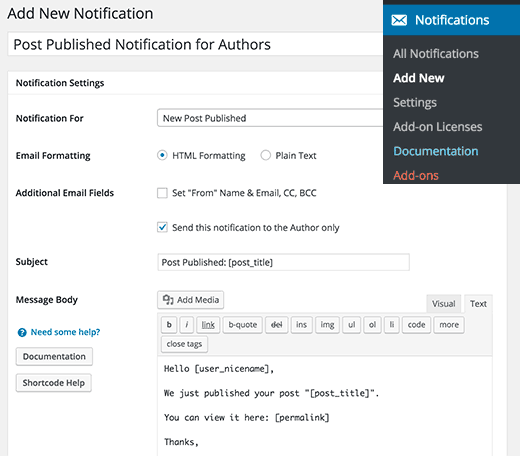 The plugin will now send a notification email to authors when their posts are published in WordPress. For more detailed instructions, see our guide on how to add better custom notifications in WordPress. This method is for users who are comfortable adding code snippets in WordPress. This code runs when a new post is published in WordPress. It sends an email notification to the author using the subject and message defined in the code. Feel free to change the subject and message fields to meet your needs. If your authors complain about not receiving email notifications, then check out our guide on how to fix WordPress not sending email issue. 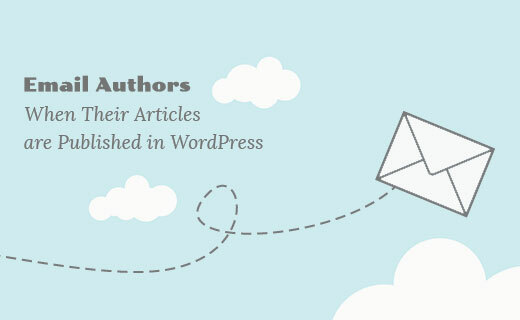 We hope this article helped you email authors when their articles are published in WordPress. You may also want to see our expert pick of 21 plugins to efficiently manage WordPress multi-author blogs. Any help as to how will I go about notifying the author of a post when a post status has been changed back to draft? i’m using Method 3 (adding code to function.php) and it worked fine for some time . but now it’s sends 4 email to the author instead of 1. do you have any idea what went wrong? I have implemented the manual step. Is there a way I can add UTM parameters as well? thank you i was searching for this and got your site. Hi, first of all thank you for your great article and sorry for my bad english… I am italian. 1) I manage a multi authors site. 4) The purpose of this form is to send and email to the subscribers only when the author of the post publish a new post. In a few words. The author John write a post. The visitor Adam fill in the form (under the post) with his name and email, and from this moment, every time John will write a new post wp will notify the event to Adam and to all the others John’s subscribers. The question: there is on the market a plugin like this? You can use this RSS feed to create a mailing list for each author on your website using a service like MailChimp. See our guide on how to add email subscriptions to your WordPress blog, it shows creating email lists for your main RSS feed, simply replace the main RSS feed for author RSS feed. You can then use a lead generation solution like OptinMonster to add after post signup forms for each author.